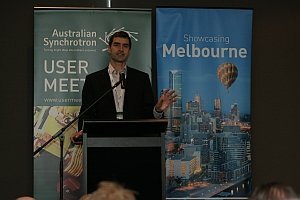 The 2010 Australian Synchrotron User Meeting attracted around 230 synchrotron experts, users and potential users and other interested observers to Melbourne in late November. 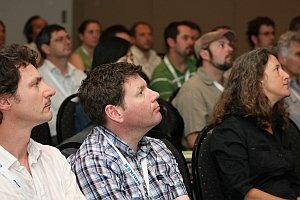 Held within easy walking distance of Carlton’s many cosmopolitan cafes and shops, the User Meeting provided numerous opportunities for participants to discuss their research, learn from each others experiences, and plan future collaborations. 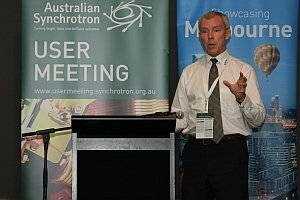 During the meeting, delegates heard presentations from five Australian and international plenary speakers, the winner of the 2010 Australian Synchrotron Thesis Medal, and more than 60 other speakers. They also viewed more than 50 posters. Matthew Wilce from Monash University (right) spoke about the value of combining macromolecular crystallography structures and small angle x-ray scattering (SAXS) studies. Refining crystal structures inside the molecular envelopes indicated by SAXS data can provide a far more accurate picture of the behaviour and tertiary structure of large biological molecules in solution than either method in isolation. David Parsons from the Adelaide Women’s and Children’s Hospital (left) discussed his use of synchrotrons to speed up the development of a non-invasive method for measuring surface liquid depth in the airways of cystic fibrosis (CF) sufferers – and hence assessing the impact of particular treatments for CF. His team acquired their first mouse x-ray image at the Australian Synchrotron in June 2010. Ulrich Schade from BESSY II in Berlin, Germany, spoke about operating a storage ring to maximise production of intense radiation in the terahertz and sub-terahertz range. Scientific applications in the THz area include studies of superconductors and models of tooth decay. The far infrared beamline at the Australian Synchrotron allows a variety of gas and condensed phase experiments to be conducted across a wide spectral range from THz to visible frequencies. Yasumasa Joti from RIKEN presented an update on the development of an x-ray free electron laser (XFEL) source at SPring-8 in Japan. The XFEL is expected to be complete by mid-2011. He also discussed the potential for near-atomic-resolution imaging of biological supramolecules with XFEL. Hermann Franz from DESY, the Deutsches Elektronen-Synchrotron in Hamburg, Germany, presented an overview of possibilities resulting from DESY’s new high-brilliance PETRA III synchrotron source and associated facilities, which are already taking external users. Ian Gentle (right), the Australian Synchrotron’s head of science, presented the 2010 Australian Synchrotron Thesis Medal to Martin Duriska from Monash University for his PhD thesis entitled ‘Introducing Multiple Functions into Discrete Supramolecules and Coordination Polymers’. Ian told the meeting that the standard of entries was so high on this occasion that two commendations had also been awarded: to Lorien Parker (Crystallographic Studies of the Recognition of Anti-cancer Compounds by Glutathione Transferase Pi) and Grant Webster (Applications of Resonance Raman and Fourier Transform Infrared Microspectroscopy in Malaria Research). 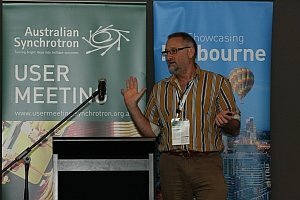 On the final day of the meeting, delegates attended a series of presentations on some of the beamline types that may be considered for the next stage of the Australian Synchrotron’s ongoing development. More photos will be uploaded shortly.